When people to ask me, an English graduate and self-confessed bibliophile, ‘so what is your favourite book?’, it sends my mind reeling. Do I pick from my childhood loves of Harry Potter, or do I go to my Gothic favourites of Dracula or Wuthering Heights, or do I even bring out the doorstopper of a novel, Gone with the Wind? It honestly is one of the hardest questions I’ve ever had to answer. But I do usually narrow it down to a few select books, and have justified reasons for so. And within this, Donna Tartt’s The Secret History is always there. Now known as a Pulitzer Prize-winning author, and with massive international acclaim, Tartt and her The Secret History is not an unknown book or author, and nor is it one that quietly unappreciated. 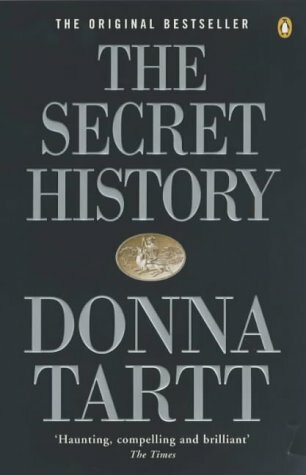 As a debut novel, and written in 1992, The Secret History had an initial print run of 75,000 copies (which is a big deal, considering the usual print run is 10,000) and it instantly became a best-seller. In her literary life, Tartt has only written three fictional books, yet she has amassed a huge following, and whenever I read her books, I find myself feeling so unbelievably small when you experience the genius way she crafts sentences and plots. So, through this brilliantly more-ish and highly addictive tale, the reader meets Richard Papen, as he gives the recollections of his time as a freshman in an imposing and highly prestigious college in Vermont. And whilst in this college, Richard quickly falls under the allure of the reclusive and almost other-worldly Classics students, and quickly becomes friends with them all. But as he falls further into the group, and the complexities that they all have, Richard finds himself tangled up in a web of terrifying crime, ancient Grecian traditions, and tragic circumstance which ultimately ends up in the murder of one of the group members by the rest of them. Labelled as more of a ‘whydunit’ rather than a ‘who’, the novel explores the ideas of increasing anxieties, builds up of tensions, unavoidable circumstances and the panic that comes with guilt. So this novel could happily run with detective fiction anytime, and as it is written in such an excellent way, it really gives the reader the sense of actually being there, committing the crime and reaping the consequences. As the text deals with a very Classics-heavy theme, this novel certainly has elements of a ‘Greek tragedy’ to it. With whole unavoidable circumstances, hamartia, fatal flaws and an overall ‘tragic’ element, the ancient Grecian world does impact on the text. And I, as a once-Classics student, really appreciated it. But this novel can be easily read by any person who is hungry for a satisfying and stimulating read. The novel also would appeal to readers who like the ‘campus’ genre of fiction, as the college that they all attend is beautifully described, and makes you wish you could see Vermont throughout the seasons. Through her writing, Tartt has really reached down to the subconscious of the human mind and has, therefore, made characters so unique and realistic that you cannot help picturing and drawing from them. With the complex nature of Henry – who is, by far, my most favourite character – Tartt has given him enough depth, personality and mystery to make him a puzzle. And even with Richard, who as the protagonist and newcomer to the group could seem a little flat compared to the rest of the students, he seems realistic, and gives the reader an outsider view on the strange group of students that he becomes friends with. The novel doesn’t seem to drag, but tease the audience with little tidbits here and there, and makes the ending well-done and highly satisfying. This text works brilliantly as a stand-alone piece of work, and there isn’t necessarily anything else Tartt could have done to make it better. Easily labelled as a modern classic, Tartt is really an author to read and watch out for. I know that I am highly anticipating the next novel.